She had daily apparitions from June 24, 1981, until May 7, 1985. On that day Our Lady confided to her the last of her ten secrets. Our Lady told her that for her entire life she will have an apparition every year on June 25, the anniversary of the apparitions. And so far it has been just that way. 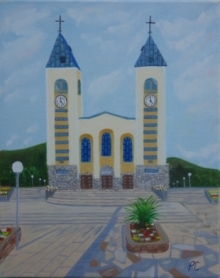 Ivanka is living in the parish of Medjugorje, is married and has three children. Ivanka: "When the apparitions began, I was only a child. I prayed and went to church when my parents asked me to. Now when I pray, I feel united with God and Our Lady. Before, when I went to Mass, I didn't feel anything special. Now, I know God is alive at the Holy Mass and gives Himself completely to us in the Host. Concerning my own future, I leave it completely to God - my path will go in the direction God leads me. I have some advice for young people: I want to tell them to turn to God as soon as possible because He's the only one who can lead them to happiness and truth. We simply must pray more and live the messages of Medjugorje."